Super Savings! Up to 31% off on Joint Calipers & Dividers at Hydraulic Hose Fittings. Top brands include Golden Mean Calipers, Starrett, Groz, & AI. Hurry! Limited time offers. Offers valid only while supplies last. 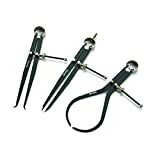 Golden Mean Calipers - Medium 7" (18cm) - Measures From 1.5"-12.8"